The book traces the story of Moli, a young autistic girl, and her relationship with friends, teachers and students. The Sunflower Detachment traces the story of Moli, a young autistic girl, and her relationship with friends, teachers and students. With a fresh and lively voice, the novel follows Moli's own internal questioning and journeys through her moments of confusion and self-understanding. The book explores teenage psychology and makes readers feel love. 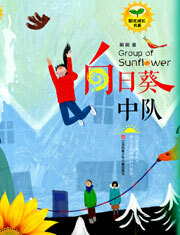 Winner of The Laurel Prize of Children's Books in 2016, The Sunflower Detachment was selected as a Monthly Valued Book in China and was also recognized as a 2016 Excellent Children's Literature National Publishing Project. Shuashua is a member of Jiangsu Writer's Association and a lead writer for Nanjing Literature League. She has focused on works exploring teenage psychology and popular science for many years. Her works have been exported to Singapore and Malaysia.